PLANT: Shrubs to 4 m tall, armed. 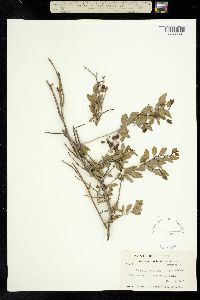 STEMS: green to gray, or brown, canescent to glaucous; branchlets thorn-tipped, occasionally with axillary recurved thorns, the thorn tips mostly glabrous and brown. LEAVES: thin or thick, deciduous; stipules triangular; petioles 0.5- 5 mm long; blades linear to narrowly elliptic to oblong or ovate, 5-20 (-27) mm long, 2-15 mm wide, green to pale green, glabrous to canescent; margins entire to serrate or crenate. FLOWERS: inconspicuous, (1-) 2-15 (sometimes more) per inflorescence; hypanthium 1.0-2 mm long, glabrous to canescent; sepals yellowish green, glabrous to canescent; petals ca. 1 mm, white to light green; stigma 2-lobed. FRUITS: blue to purple to black with white waxy bloom, 5-8 mm wide; pedicles becoming thicker in fruit, the floral cup persistent. NOTES: 2 vars., both in AZ, CA to OK; s to Mex. The leaf and branch morphology of Z. obtusifolia is variable. Solitary serrate to crenate ovate leaves with marginal glands on thorn-tipped canescent branchlets are representative of the new growth; older stems have leaves that are entire, oblong, elliptical or linear and are arranged in short shoots. The short shoots may become woody with age. Elongation of the short shoot into new thorn-tipped branches may occur, being evident by a leaf scar. The leaf size is dependent upon climate, habitat and season. REFERENCES: Kyle Christie, Michael Currie, Laura Smith Davis, Mar-Elise Hill, Suzanne Neal, and Tina Ayers, 2006 Vascular Plants of Arizona: Rhamnaceae. CANOTIA 2(1): 23-46.